BANFF, ALTA. – With the 2014-15 curling season set to sweep curling fans across Canada, TSN today announced the draw and broadcast schedule for the fan-favourite PINTY’S ALL-STAR CURLING SKINS GAME at The Fenlands Banff Recreation Centre in Banff National Park from January 16-18, 2015. 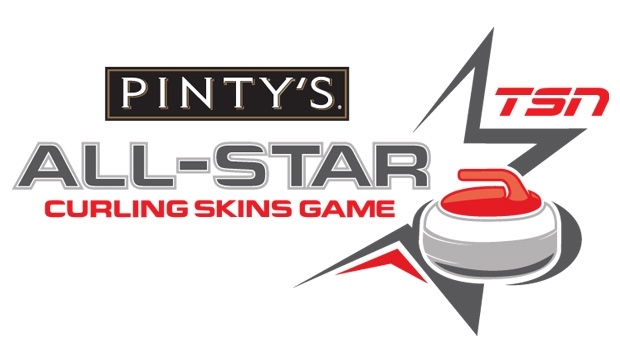 Complete event information for the PINTY’S ALL-STAR CURLING SKINS GAME is available on the event’s dedicated microsite, TSN.ca/curlingskins, which launches today. With the addition of a women’s competition for the first time since 2003, TSN’s total broadcast coverage doubles from nine to 18 hours and expands the total number of draws from three to six. Exclusive accommodation and ticket packages for the PINTY’S ALL-STAR CURLING SKINS GAME are now available. Fans can visit RimrockResort.com/TSN or call 1-888-RIMROCK for information on the hotel’s various packages. Beginning Wednesday, Nov. 26, ticket packs will be available for purchase through The Banff Centre. Fans can call 1-800-413-8368 for information. As the official broadcaster of the Canadian Curling Association, TSN broadcasts more than 300 hours of live Season of Champions curling each year, including the Tim Hortons Brier and Scotties Tournament Of Hearts, World Men’s Curling Championship, World Women’s Curling Championship, Capital One Canada Cup, WFG Continental Cup, and M&M Canadian Juniors.